Civitella today, is an oasis suspended in time and space. A crown on the crest of a limestone hill, at 550 metres above sea level, where the village bell tolls every quarter of the hour for the past 500 years. The village counts just over 100 inhabitants, two restaurants, one bar, a postal office, one hairdresser (male and female, that is) and of course the shop for one’s daily food supplies. It is only 8 km away from the Arezzo highway exit, 12 km away from the next traffic light, and 9 km from the next factory. It is 40 km away from Siena, 60 km from Florence and 70 km from Perugia. Civitella is the prime example of a small but proud city-state. A cosy living-room if you wish, where we receive our valued guests. Every alley, every commanding view are clear examples of unique beauty set in a captivating scenery. And, tourism has not yet taken possession of Civitella, which we are quite pleased about. On the low village walls, the elderly take a rest and talk about memories and present topics; children play carefree on the main square, and sometimes the calm is interrupted by a tractor that comes to take water from the village cistern to take to the surrounding vineyards. We understand the concept of the human scale but rhythms, habits, and the hectic passing of time are not part of our way of life. We eat lunch at noon because we say that “noon sounds one time only”, after the passing of which our greeting turns to “good evening”. And on Sunday we all meet at Mass, dressed to our best, the women divided from the men, when we all speak a little ill of others but for whom, at the end, we have affection. 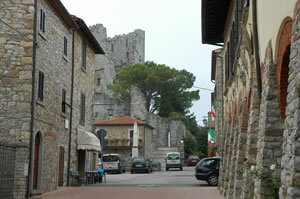 Civitella in Valdichiana is a village which has very ancient origins. It existed already as a settling during the times of the Etruscans and Romans. Its natural position on the crest of its own hill permits a control of its surroundings, and, enabling commanding views at 360° as far as the eye reaches. The Longobards, during the 6th and 7th centuries, made the village one of the most important fortresses of the region and set it inside an elliptic boundary wall which is still visible today. During the 10th and 11th centuries Monasteries, Abbeys and Hospitals were founded in the region along the ancient Roman ways, an activity which continued throughout the Middle Ages. Civitella, during these periods, enjoys constant and important growth and development. From this period stories on the Civitella Feud become more numerous and detailed until the time that Civitella, towards the end of the first millennium, becomes the property of the Bishop of Arezzo. Hence the name “Civitella del Vescovo”, which means “Civitella of the Bishop”. Dominating the way to Florence and Siena, Civitella occupied a position of great strategic importance, being a military refuge as well as a summer residence. 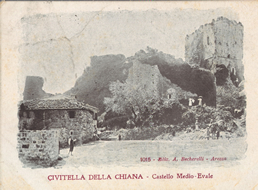 Civitella and its castle witnessed the battle between the Guelfi and the Ghibellini and enjoyed its most prominent time when Bishop Guido Tarlati made it his residence, in 1318. During the 14th century the castle, like many others in the region, saw itself alternate between the dominance of Florence and that of the Bishops of Arezzo, up to 1384, when it passed definitively under the Giglio (Florence), to become the administrative centre of the commune. The absolute power of the Church, the heretics and their persecution gave Civitella an air of mystery resulting in stories of witches and of good people, of rituals and of faith. Civitella and its administrative centre prospered during the following centuries until it entered into a period of crises in the 18th century. It was dismantled in 1808 as per Napoleonic legislation, and it was abolished definitely in 1838. A quiet village of good people devoted to handicrafts and to agriculture, it had come to know the horror of wars which made Civitella today a symbol of culture and peace.